Hailing from the kitchens of Sly Granny, Hotel Delmaar with its colonial-era ambience and eccentric decor including quirky monkey wallpapers has recently opened up at Select CITYWALK. With wooden chairs and partitions, this picturesque restaurant has been winning hearts since its opening on the 16th of January. Adding to the vivid food landscape of Delhi, Hotel Delmaar is known for its delectable cuisine and remarkable hospitality in the food space. Founded by Kabir Suri, Rahul Khanna along with cuisine director Janti Dugal, Hotel Delmaar is an integral part of the Azure Hospitality group which also owns established food outlets like Mamagoto and Dhaba Est 1986. Talking about the inspiration behind this unique, quaint restaurant, the concept enfolds the abstract thoughts of travellers, ports and gastronomy, all intertwined together. As an upshot, Hotel Delmaar started off, perfectly amalgamating the incredible concept of lost time and the nostalgia one feels towards it. With colonial era décor accentuated using unconventional methods, Hotel Delmaar makes you travel back in time. Whereas musical background feels soothing, the quirky wallpapers add more to the fun element. The wooden chairs and white wooden partition at the entry perfectly complement its regal charm. With a fresh minty flavour that is just irresistible, the special house lemonade offered by Hotel Delmaar is a must have. 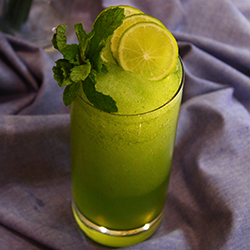 The fresh lemon juice with added mint makes this cool drink, the ultimate refreshment. 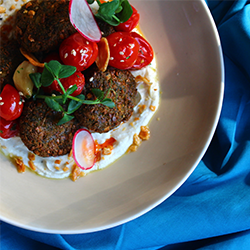 If you are a yoghurt lover, this tahini yoghurt topped with falafel balls and freshly picked cherry tomatoes will make you fall in love with it. Choose this dish if you want to give your appetite a nice, refreshing retreat. 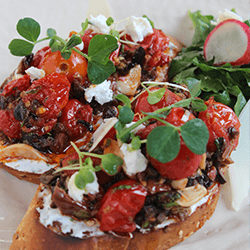 With lots of fresh ingredients, this goat cheese and confit cherry tomatoes bruschetta is a perfect dish to satiate your food cravings. The robust flavour of cheese accentuated with ingredients that taste just heavenly vow for its unparalleled wholeness. 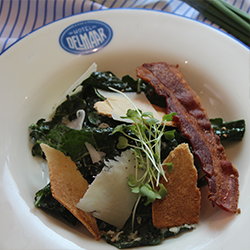 The Kale leaves showered with freshly ground black pepper, crispy bacon and caeser dressing make this salad a crowd pleaser. The use of simple ingredients to make an exquisite dish like this speaks volumes about the culinary magic served at Hotel Delmaar. So the next you show up at Select CITYWALK, do not forget to check Hotel Delmaar, an exquisite restaurant from the esteemed Azure Hospitality Group.